ARM CEO says semiconductor companies must give up more of their revenue to sustain IP suppliers. IP-driven design to System-driven design, by increasing both horizontal and vertical collaboration. In August 2011, at the GLOBALFOUNDRIES Technology Summit (GTC), ARM CEO Warren East encouraged reluctant Electronic Design Automation (EDA) executives to see the value in horizontal collaboration. At the Semico IMPACT Conference in San Jose this week, East repeated that theme, offering examples of how the semiconductor intellectual property (SIP) supplier collaborates vertically and horizontally in its offerings to semiconductor designers. However, East issued a new challenge at IMPACT, this time taking his own customers to task for what he asserted is a false sense of differentiation. There has been an ongoing discussion with customers, East said, regarding how much they do for themselves - to hold onto differentiation, and how much ARM and other IP suppliers provide. He then went on to say that semiconductor companies will need to give up some of that "perceived differentiation". Repeating a complaint that has long been heard from EDA vendors, EAST stated that more of the value that accrues to system and SoC designers must flow to the IP companies in the future, if they are to survive. Citing Semico's revenue estimates, East acknowledged the "encouraging" 25% projected growth rate of his $3B+ SIP industry, which is outpacing the semiconductor industry he serves, while still claiming that the proportion of end system value which goes to companies such as his is too small. East's economic calculus is based on his proposition that greater collaboration throughout the semiconductor ecosystem will reduce the costs of System on Chip (SoC) development, such that greater value can accrue to suppliers. To achieve this, IP providers would need to expand their role to take on more of each of the costs that are now borne by the SoC integrator, hence delivering more value. To go more vertical in SoC design, ARM is promoting their physical design IP, in the form of Processor Optimization Packs (POPs). East's claim is that it makes no sense for companies to develop their own physical libraries, which many do with synthesizable IP from ARM, as costs have risen to $12M at the 32nm node. In an example from Panasonic, East claimed that a 40% reduction in Time-To-Market was achieved by using a Cortex-A9 POP. ARM's argument is that achieving the shorter TTM is more valuable than striving for differentiation. 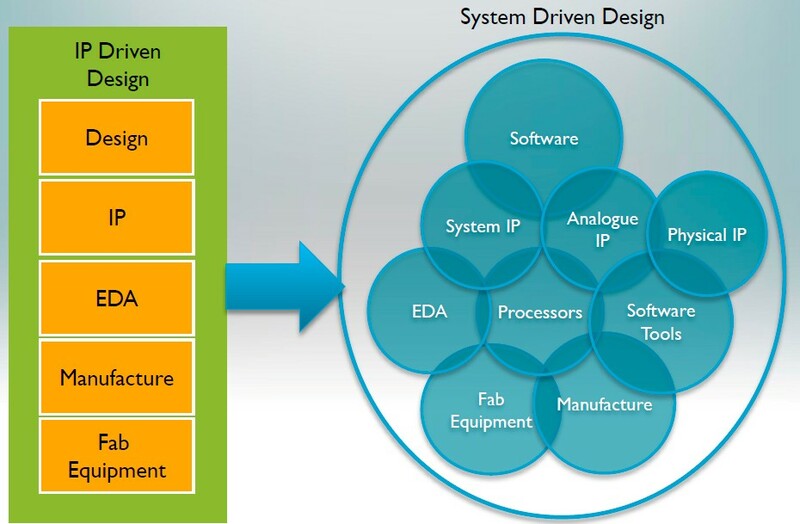 ARM is also seeking to address more of the the software component of SoC design, which many claim to now account for greater than 50% of design cost. In Linaro, ARM is seeking to foster development of another Open Source Linux-based operating system, optimized for ARM architectures. ARM is also planning to move further into system security, with the recent announcement of a joint venture to improve security for connected devices, by developing a Trusted Execution Environment (TEE) based on the ARM's TrustZone security technology. While a move to more complex IP subsystems (i.e. a collection of related IP blocks) and software, may enable more highly-integrated vendors to derive more value, to some extent East's argument goes against the very same history which he cited. For the SIP industry, like the EDA industry, growth occurred when a shift to the fabless model enabled economies of scale to be achieved through outsourcing. As the industry transitioned from being dominated by Integrated Device Manufacturers, EDA tool providers could amortize costs across a larger number of customers than could the IDMs, making most in-house tool development unjustifiable. Disaggregation spread. Leverage dictated that the semiconductor industry grew faster. More automated design flows, brought about by the use of more sophisticated EDA tools, then created an opportunity for suppliers of commodity IP (e.g. gate cell libraries), and some specialized but standard IP (e.g. I/O interfaces). IDMs even found that it made sense to outsource the components of their designs which created no differentiated value. As chip complexity grew, suppliers of complete processor cores and memory subsystems also grew. SoC complexity will continue to grow, as it always has. Such was the response from Synopsys CEO Aart de Geus, at a press conference held during the Synopsys User Group meeting in March, when EE Daily News asked about competing more against customers with the company's SoC audio subsystem. "They will move up (in complexity)", said de Geus. Managing that complexity, to create a complete SoC, will continue to be where the greatest value accrues. Differentiation will continue to be in the eye of the beholder. Nice reporting, Mike. Thanks for the story.